Ships from and sold by Sherper's Inc.
Sold by Outdoorsman Lab and ships from Amazon Fulfillment. worked great on an overnight backpacking trip in south texas (in the july heat). 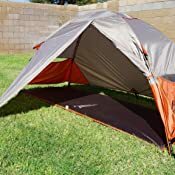 — francisco sauceda jr.
5.0 out of 5 starsAWESOME TENT!!!! Listen here my fellow campers. I am one of those people that does extensive research before making any purchase so that I am sure its what I want, and I dont end up spending 100+ dollars on something I will regret later. I was so happy with this purchase, I am not sure where to start explaining. Ive camped probably 8 times with this tent since Ive bought it, from Desert heat in the Mojave to Snow in the Sequoias, even really windy conditions at the top of some ridges, even rain and hail storms. This tent has not only held up great, but its kept me really dry. 5.0 out of 5 starsBest Bang for the buck. Period. 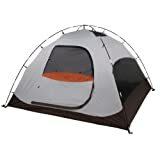 I purchased this tent after spending countless hours researching tents, crawling in and out of them, comparing features, and studying set up and weight. 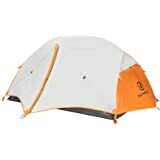 This product came in under cost for what I had planned on spending, and I have gotten a chance to test it in fairly poor weather conditions. 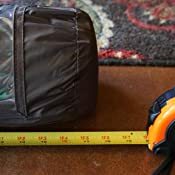 This tent weighs about 2 pounds 12 ounces. I immediately ditched the steel stakes it came with and chose to use 3 lightweight aluminum stakes instead. One for the vestibule, two for the corners on the opposite side of the tent. This held well in winds 5-10 miles per hour in both tests, I have not tested it above these conditions. It is small. I am 6'3" 200 pounds and there was not much extra room inside. That being said I was extremely comfortable. The smaller size allowed my body temperature to heat the inside fairly quickly. 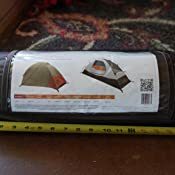 I used a thermarest self inflating pad large sized inside, with a quilt and a blanket in 34 degree Fahrenheit temperatures and was warm all night. Setup and take down is incredibly easy, and can be done in under two minutes. During test #2, it rained/snowed all night. A footprint is a must. Water did come through the bottom of the tent without one, but my mattress kept me off the ground. It did not pool through, but moisture did come through the floor. 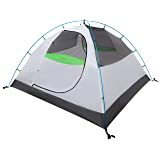 There are two vents at the top of this tent that help to reduce condensation, as well as four loops up top you can string oaracord through to hang things like socks to dry. The vestibule was big enough I could put my kelty coyote 85 liter off to one side and still had enough room to get in and out of the tent. 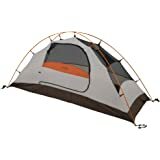 As I continue to use this tent through upcoming trips I will add to this review if needed. For the price, features, and performance so far, this is the best bang For the buck especially if you're on a budget. Happy camping, feel free to message me with any questions. And ditch those heavy steel stakes. ((INITIAL REVIEW)) This looks like it could be a winner. I really like that it came with a patches in different colors for repairs and the guidelines has easy line tensioners. 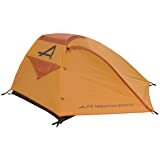 I purchased the floor saver with this tent and posted a review on that ALPS Mountaineering Lynx 1 Person Tent Floor Saver . 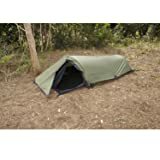 With the floor saver and this tent you can easily setup the rainfly before you setup your tent. By doing this you prevent water from getting into your tent while you set it up. I'll update this review after I put it to the test in the field. I have attached photos for those who prefer to view then read. I've had this tent for about 2 years now. I love and adore it, and it's lasted a bunch of trips. It is a great fit for one person plus gear (I'm a strong independent hiking woman who don't need no man). I also love that the rain cover goes all the way to the ground and has a vestibule to keep the dirty stuff outside and dry. Used this tent to backpack in on a bow hunting trip this past fall with some buddies that had bivy sacks. I definitely had the best setup especially after a rain storm hit on the second day. Everything stayed dry. 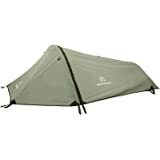 Hard to beat this tent ounce for ounce against the other companies selling lightweight tents. The tent is definitely a single person tent. Just enough room to sleep in and just enough room in the vestibule to store a pack and all your food. 5.0 out of 5 starsFor the price, unbelievable. Bought this one a whim. 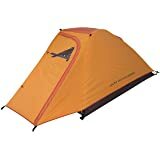 At the time, I was planning a 2-night backpacking trip and needed a tent ASAP. 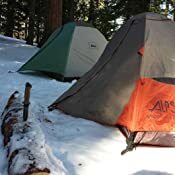 I did a minor amount of research on 1-person backpacking tents and got spooked by prices and negative reviews. It felt like I had to spend 300-500 bucks to get anything of decent quality. I have to say, this thing performs better than any 1-person tent I've ever rented or borrowed. That includes my buddy's Big Agnes tent. I had a heck of a time setting that tent up. This tent, however, goes up so easy - it's insane! It is very sturdy, even in high winds. The rain fly is great too. I used it even on dry nights to keep moisture out. The vestibule created by the fly is handy, too. I stored my boots right there so I could slip them on and off as I got in and out of my tent. One of the biggest complaints I read about was size. I'm 6' and I weight about 215 and my head and feet didn't touch either wall. I'd say any taller than me and you may brush up against it here and there. But it's not claustrophobic by any means! Disassembly is easy too. You'll have it packed up in minutes. I forgot my footprint the first time I took it out and was a bit concerned the ground would damage the base of my tent. It didn't even scratch it. This thing is durable. I have assembled and disassembled around 10 times now and it still looks brand new! I'm telling you, this tent performs like it should cost around $400. It's definitely worthy of the AT or PCT, in my opinion. Use the money you saved to buy a better sleeping bag or air core, because that's where the comfort is at night. The only thing that the description had wrong was weight. Not that it matters a whole lot, as it was a bit less than a pound heavier. BUT, if you're prepping for a long hike, every ounce counts. So keep that in mind if you're purchasing this for a thru-hike. 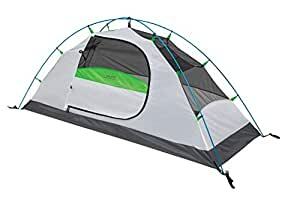 If you need a tent right now, this is the one!